ILYT | What Does ILYT Mean? 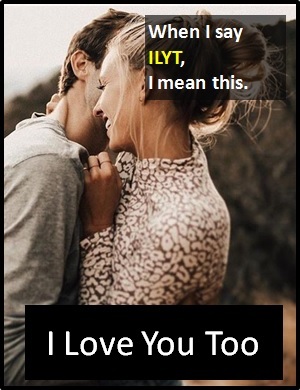 ILYT means "I Love You Too". Naomi: Bye! Speak tomorrow. Love you. Rob: You are absolutely the worst singer that I have ever heard! ILYT has exactly the same meaning as the abbreviation LYT (Love You Too). "I Love You Too" is also commonly abbreviated as ILU2 and ILY2. ILYT is usually a reciprocal statement. Wife: You are the most useless cook I've ever met. ILYT is an abbreviation of "I Love You Too" and is typically used as a standalone declarative sentence , (i.e., a statement). It is not often used as another part of speech within a wider sent sentence. ILYT is an initialism abbreviation. Technically, this means it is pronounced using its individual letters (i.e., Eye Ell Why Tee). However, it is not often uttered using its letters. In other words, the abbreviation ILYT is for efficiency in writing and not efficiency in speech. Before the digital era, we would have just said "I Love You Too" instead of using ILYT.